Outfitting your roof with solar panels can be a great way to save energy and money. Right? Well, you won’t save as much money in California, where new rules will force rooftop panel owners to shell over some extra money to their local energy provider—even if they don’t need them at all. 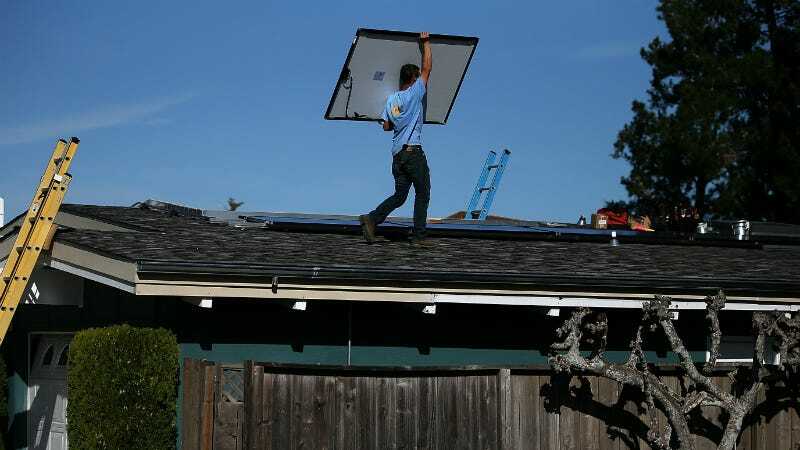 In a vote in California today, the California Public Utilities Commission voted to bump fees up for folks who’ve got solar panels installed on their roofs. With the new decision, new solar customers will pay a one-time “reasonable interconnection fee” to get them on the grid, which could cost anywhere from $75 to $150. Then rooftop solar owners must also shell out around $6 a month to account for any electricity they use from the utility companies, regardless of how much solar power their own private panels churn out. Utility company Southern California Edison estimates the typical solar customer currently pays $82 a month, and now they’ll pay $91. If the utilities had fully succeeded in the vote, that rate would’ve gone as high as $103. It wasn’t a total loss for opponents of the new ruling, though. Net metering was left intact—that’s when solar panel owners are compensated for the electricity they produce from their panels that’s in excess of what they use from the power company every month. While no one is arguing that they’re against the idea of solar energy, the debate stems from—what else?—money. The utilities companies argue that those customers without solar panels may end up paying less than those who do have them, so they’ll lose revenue. That’s also why the amount of money customers can make back through net metering is capped. California’s not alone in this dilemma. Earlier today, Bloomberg Business reported that Nevada faces similar struggles between solar owners and utility companies. Nevada, like California and around 40 other states, all participate in net metering. And like in California, Nevada utility companies aren’t happy about it. In fact, Nevada’s largest utility, NV Energy, is fighting net metering tooth and nail. While everyone wants to save the environment, all the laws and money swirling around green technologies that end up atop people’s houses create a complicated future for citizens looking toward renewable energy to save a buck.